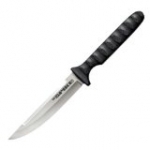 Cold Steel is able to give us Light Duty/Self Defense blades at a good price. GOOD- secure-ex sheath, blade design option, handles give you good traction, scandi grind. BAD- 4116 stainless steel is a soft budget steels that dulls quick, really only good for self defense.